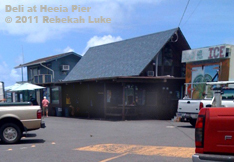 You'll likely be pleasantly surprised at the food from this hut at the end of Heeia Pier. Sometimes life makes me grouchy. Other times it feels like the stars are aligned. Today my lucky stars aligned. My frequent route from the studio takes me to Kaneohe for water exercise at Pohai Nani’s heated pool. Last month I was sidelined with a physical pain that I can only be sure is a characteristic of aging, as neither my physician, naturopath, physical therapist nor radiologist can pinpoint anything else. Just because something shows up in a test doesn’t mean it’s the cause of pain, they concurred. This “problem” made me grouchy. All I felt like doing was … well, I didn’t feel like doing much of anything. With the various therapies and time, including Reiki on myself, I’m improving, feeling finer. Hallelujah! Still, though, as the saying goes, there are some good days and some bad days. This morning Malia said she was outfitting her bicycle and planned to add some cycling to her exercise routine. She was also in a competition to lose some weight. On an impulse I said I’d join her. Bicycling on the tandem is something I can do with DH. We used to do that a lot when he raced, even taking our bicycle on neighbor-island and continental trips. We were our thinnest then. Malia’s goal is to shed 30 pounds. Mine is to reduce by 20. That’s a total of 50 pounds between us, all by Thanksgiving Day. I reloaded the free Lose It! ap to my iPhone to show I was serious. All I do is program my goal, enter what I eat and my daily activity, and it automatically calculates the remaining calories I may have. I think I have a good chance of meeting my goal because I’ve already started to change my diet after reading the book Anticancer. Please see my previous post. After the pool and some errands, I swung by Heeia Pier for lunch and scored a good parking place, step one. The place has become popular with the breakfast/lunch crowd, and sometimes I have to park on the far side of the boat ramp. Looking at the menu board and considering food choices and my lack of cash — pay day for me is tomorrow, and I robbed my parking meter fund of quarters today — I picked “stir-fried veggies” for $3 and an honest cup of coffee for 50 cents. Gooch — that’s his nickname — must have seen my face fall. Or I must have looked hungry. He said the vegetables didn’t look good enough to serve, so he’d just pulled the item from the menu. “What kind of vegetables do you want?” he asked. “Anything. If they’re fresh,” I said. Returning from the reefer he said he’d make me some. 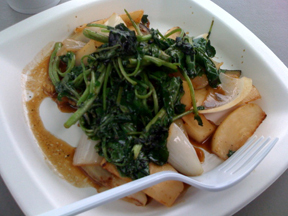 Before the firefighters got their plates, Gooch brought me a light and tasty medley of eggplant, turnip, onion all from JAWS (Just Add Water, a CSA community-supported agriculture group) in Waimanalo, and watercress from his relative’s farm. 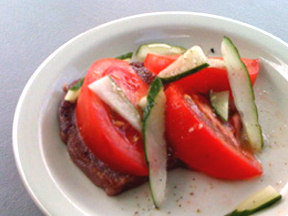 Half way into it he brought out—on the house—another dish on a real ceramic plate, not a disposable plate: a slice of pan-fried pa‘i‘ai (hand-pounded taro from Daniel Anthony and Anuenue Punua of Mana Ai), topped with a fresh salad of chilled local tomato and cucumber, very very lightly dressed in a barely sweet sesame vinaigrette, and sprinkled with a little pepper and sea salt. Can you believe it?! Now that’s classy. Not just the food, but the customer service too! Committed to serving organic and/or locally grown food as much as possible, Chef Noguchi sometimes goes into the field to harvest the ingredients personally. If you go to Heeia Pier and he’s not busy, ask if there is anything else not on the regular menu that’s being served up that day. You never know! I think if you caught a fish out there from the pier, he might cook it for you too (if you cleaned it first ;-)), just like it used to be local style. So healthy. So delicious. So unprocessed. 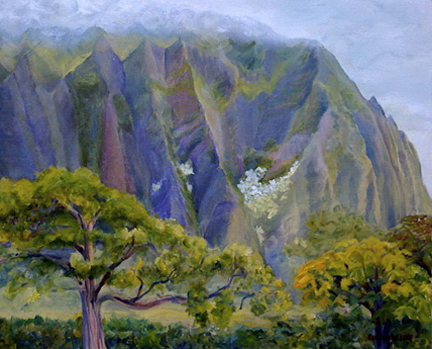 Thank you for bringing beautiful food to the windward side. Thanks to the local farmers (we can patronize the farm bureau-sponsored farmers markets). And thanks to all who support local farmers by buying organic or locally grown fruits, vegetables and meats. The stars align, but I suspect intention helps.